It might be a slight aberration or just a coincidence, but having not looked over a teardrop camper in the last 10 years, I’ve now seen two in the last 10 weeks. So is there a trend happening? Have a growing number of manufacturers suddenly found this niche worth exploring? 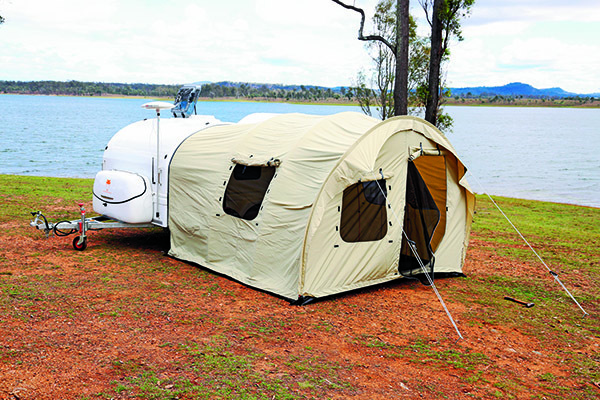 This time, I checked out the new Taipan Tucana teardrop camper to see what the attraction is. 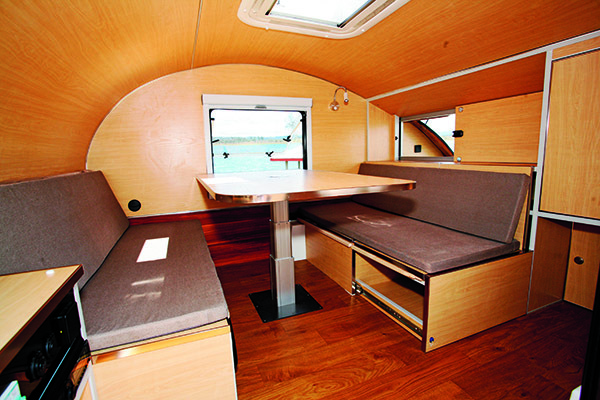 The name ‘teardrop’ describes the shape of the camper; they’ve had a long affinity with surfing community in the USA and, due to their size, are popular with motorbike travellers. 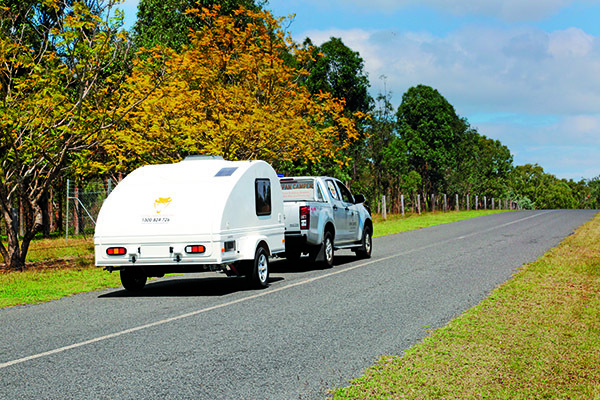 This one, like the rest of the Taipan camper trailer fleet, is fully built in China. It has a moulded fibreglass body with a composite floor, which looked a bit flimsy to me but Taipan says it’s designed with both strength and weight saving in mind. For a small camper, there are plenty of access hatches. A downsized caravan-style security door fits neatly on the nearside and double-glazed acrylic awning windows provide light and air from both sides. There’s also a large top-hinged door at the rear, in keeping with the teardrop style. With this body shape, there is never much external body storage but a moulded storage bin on the front drawbar should contain most of the external items like hoses, power lead and maybe even a camping chair or two. Underpinning it all is a 50x50mm drawbar and chassis that’s hot-dipped galvanised. It might look lightweight to some eyes but, given its unladen weight of 750kg and this camper’s intentions, it should be adequate (and sometimes we get a bit mesmerised by too much steel work). To make the Tucana ready for a bit of rough-road or offroad work, independent suspension is fitted. It comes kitted out with coil springs, trailing arms and two shock absorbers per wheel. Underneath the camper, you’ll find an 80L water tank above the wheels, and a spare wheel fitted between the chassis rails at the rear. The unladen ball weight of 45kg is something other manufacturers can only dream of and gives plenty of reserve for storing weighty items in the front storage bin. Opening the rear compartment door reveals the kitchen area of the Tucana. It’s quite a well-appointed setup with a full width stainless steel benchtop and a sink, complete with 12V pumped water supply. Below the benchtop is a slide-out for the Waeco 35L fridge to the left, two good sized drawers in the middle and a cupboard to the right. However, most of that is taken up by electrical essentials like the 100Ah deep-cycle battery, 1000W sine wave inverter and a 12V water pump. As this 240V-capable system is under the sink, it would be good to see it separately sealed in the case of a leak. A solar panel is supplied with the Tucana but it’s a bit on the lean side and anyone contemplating extended remote camping ought to consider another. There’s no cooktop supplied with the Tucana but that simplifies the trailer setup (and also reduces cost) as there’s no gas system. A portable two-burner cooktop and a gas cylinder will fit on the rear benchtop without too much difficulty if you wanted one. Above the benchtop, a shelf offers some essential storage space and, to the right, an old-style servery hatch gives access to the camper’s interior. Inside the Tucana is a surprising amount of space for a flexible layout and interior height (at least in the middle) of 1300mm. It’s also surprisingly well lit by the door, two windows and roof hatch. It’s simply fitted out, with a cafe-style dinette against the offside wall, a cupboard and shelf against the kitchen wall on the nearside and a small entertainment unit in the front nearside corner by the entry door. This not only acts as a mounting point for the radio/CD player and flat screen TV but as a place for the 12V/5V USB outlets, 240V circuit breaker and battery/solar panel monitor. Part of the entertainment system includes a pole-mounted TV antenna that attaches to the side of the Tucana body. Given the internal height, things are a bit tight inside but there is room for two people to sit easily at the dinette. It does have flat cushions (for when the dinette folds down into a bed) but it’s otherwise reasonably comfortable. The rear seat has storage areas below and behind that are accessed by removing detachable panels. It’s a fairly simple but effective arrangement. Preparing the Tucana for night-time use is a matter of lowering the pedestal mounted table, which is relatively simple, and rearranging the seat cushions. Setting up the sheets and blankets take a little longer but for those of us who don’t have the patience, then sleeping bags or a Duvalay will work quite well. 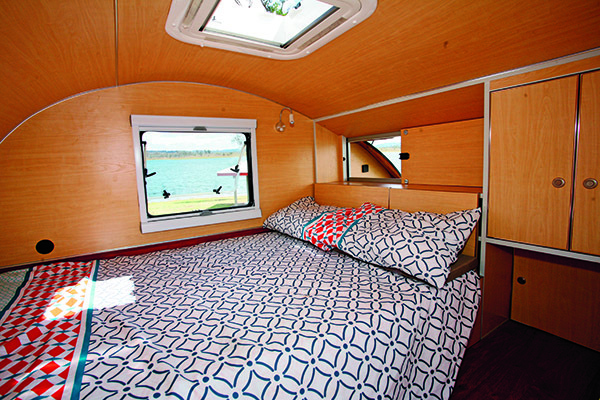 If you position the pillows towards the rear of the camper, your generous-minded travelling companion may hand you a morning cup of tea through the servery hatch. There is just one wall mounted LED light for the interior on the offside wall and I reckon a second on the opposite side wouldn’t go astray. You can attach a tent to the side of the Tucana if you’re looking for a little more space. It covers the door area but not the kitchen at the rear. It’s fairly quick to erect, even in a strong wind (to which I can personally testify) and can be used as a bedroom or an insect-free seating area, being large enough to take a couple of camping chairs and a small table. There’s no tent for the kitchen but, if you want one, there are a couple of free-standing tents that might suit. The Tucana is neither a full-blown offroad camper trailer nor a hybrid (as we know it). What it is, is a neat little teardrop camper for overnight stops that has a minimal setup time and no flapping canvas, if you don’t use the side tent. It’s also very lightweight and can, therefore, be towed by a large range of vehicles – no heavy-weight four wheel drives required here. Something like a Subaru Forester would be ideal. So are teardrop campers becoming a trend? Possibly not a major one, but the Tucana certainly provides a pleasant alternative for enjoying the Australian great outdoors in style!